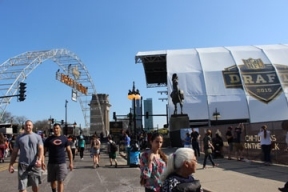 Thousands of NFL enthusiasts converged onto Grant Park over the weekend for the 2015 NFL Draft, which was hosted by Chicago for the first time in 50 years. According to the NFL, a total of 200,000 people visited the event from April 30th to May 2nd where they had the opportunity to experience flag football competitions, musical entertainment, autograph sessions, and much more. The area called, Draft Town was presented by Oikos Triple Zero. For more information, fans can visit nfl.com/DraftTown.